Plans are afoot to establish a National Mind Sports Centre where chess and Go and other strategy board games can be played. The project is a joint venture between the English Chess Federation and the British Go Association. It has long been desired to find a place to play league games and competitions and to hold gaming events. Teaching and training would be part of the mix to encourage the next generation into the boardgame realm. The latest initiative arose from Go player T Mark Hall who left a substantial legacy for the establishment of a centre in London. He fondly remembered the place where he played go as a youngster and wanted others to revive the concept. We are all familiar with the problem of finding a space for community activities. Pubs and church halls serve the purpose but are not ideal. The original National Chess Centre was in the John Lewis department store in Oxford Street. John Spedan Lewis was a devotee of the game. Unfortunately the Centre was bombed during WW2. After the war, a number of coffee houses, such as the Prompt Corner in Hampstead, open from 10-midnight, kept the spirit alive. It was popular with intellectuals such as George Orwell and European emigrés but eventually all these unique places disappeared. A recent trend is the rise of board game cafés in which patrons pay a board fee and are expected to buy some drinks and maybe a meal. These are popular with young adults who are to be found socialising in fashionable places like DraughtsLondon in Shoreditch. Chess and Go have traditionally been played in relative silence, certainly at the higher levels. This factor has made it more difficult to find suitable venues and to attract people to clubs. Bridge, being an inherently social game, does not suffer the same problem. The Casual Chess Club which is held daily in the BFI bar off Tottenham Court Road shows that playing chess in a bar with chatter and music in the background are not always incompatible. There is scope for more than one type of playing area within a venue. The latest plan is to concentrate all the activities related to mind sports into one place and to combine flexible game playing spaces with in a cafe and a merchandising outlet. The revenues generated from the commercial activities will help to defray the cost of the game activities. Fundamental to this plan is the acquisition of a property which will cost at least £3 million. There are many issues to be resolved regarding funding options, corporate structure and charitable status. Amanda Ross, who runs the Casual Chess Cafe, has been commissioned to conduct a feasibility study on the National Mind Sports Centre. She will outline her current thinking in a presentation at the London Chess Conference on Monday 12th December 2pm – 4pm. This session is open to all and does not require registration at the conference. Please come along if you would like to share your ideas and enthusiasm about how to achieve this laudable objective. The winner of the New Game Design Competition is Tatyana Ogneva from Moscow. Her chess variant called Football Chess was judged to be perfect to encourage children to play chess. One of the attractive features of the game is that uses the word “football” which automatically engages interest (not only with boys). Scoring a goal is easier to understand than getting checkmate. Children learn to direct their pieces to the square of the ball in the arrangement phase, and the better players try to hunt down the opposition team as well as aim to score. Clear rules, the rich strategies involved and a relatively quick conclusion all make this an enjoyable game to play. 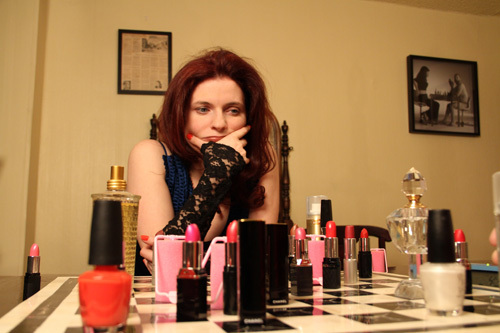 Tatyana runs a small chess club called Etud. She also has developed an online chess program for young children called Virtual Chess as exhibited at the Chess and Mathematics Conference. Originally a psychologist she studied child cognitive development and used that in designing her games. It is not surprising that the football concept has been reinvented in England, Germany and other places before. 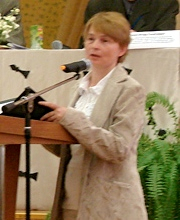 However, the judges decided that Tatiana’s game was sufficiently different to be regarded as an original implementation. She receives an award of £500 for winning the competition. The quality and number of submissions exceeded expectations. There were 20 entries in total. The judges analysed anonymised standardised versions of the games. The judges were Jerome Maufras (France), Alan Parr (England) and Rita Atkins (Hungary/UK). The full Order of Merit is as follows. Malcolm Pridmore from England was the Runner Up with Middle Game Chess and had another top 8 game, the only person to have achieved this. He thoroughly tests his games on his own children first. The First Commendation goes to Vasilis Parginos, a FIDE Trainer and National Master from Greece who is working as a chess coach in Turkey. The positions arising in his Production Line Game are very unusual and stimulating. A Special Commendation goes to Kevin O’Shea, a musician from Ireland whose game Blokkology was loved by the maths teachers. It uses dice with pieces on a chessboard in an original way. If the competition had only been about maths games, then this may have won. However, it was not quite ‘chessy” enough in making full use of the piece capabilities. Kaj Engstrom from Sweden receives a Commendation for his variant in which you must not capture an opponent’s piece. Bright children respond very well to this game and the winning plans need an early grasp of the positional possiblities. Malcolm Pridmore’s Race to the 8th Rank receives the 1st Honourable Mention for being simple and fun for beginners. Thomas Friess from Germany tested out his games on his children. His game is like a football friendly where the pieces can be substituted at any time. He receives the 2nd Honourable Mention. Chess is evolving – its purpose has moved towards the needs of schools. Whilst playing chess competitively remains an important motivating factor for many children, there is so much more that can be done. Chesss may be regarded not as one game but as a resource for all sorts of logical and mathematical mini-games, game variants and puzzles. The co-director of our conference and frequent author of this website is celebrating his sixtieth birthday this Tuesday. Of Irish origin, he studied in Oxford, Lancaster and London. He is also a qualified barrister. Apart from practicing law he worked in highly qualified positions in the film and media industries. Full of ideas, he has always a fascinating project on his hand.